In a small bowl add 1 teaspoon of smoked paprika, 1 teaspoon of garlic powder, 1 teaspoon of salt, ground cumin, dry cilantro, and 1/2 teaspoon of cracked pepper. Stir to mix. Pat Mahi Mahi dry and rub spice mixture onto all sides of the fish. Set aside. To a food processor add, greek yogurt, 1/2 teaspoon of garlic powder, chipotle pepper, 1/4 teaspoon of smoked paprika, 1/4 teaspoon of salt, and lime juice. Set aside. Spray grill grates with PAM or rub down with olive oil. Add tortillas to grill and grill 1 minute per side to warm up and remove. 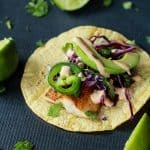 To assemble tacos, add one strip of grilled fish to corn tortilla, top with thinly sliced purple cabbage, sliced avocado and a drizzle of chipotle lime crema.